GTO, Fish, and whatever: It's Peppa-Time! It's that magical time of year when my Caribbean Red Hot Peppers are ripening. And not a minute too soon, the ones I had diced and frozen from last year are just about gone. These peppers make jalapenos seem like candy. 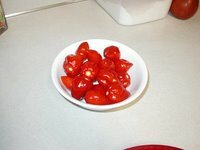 I've already chopped some fresh ones up and put them in the freezer to sprinkle on pizza, and to give chili a kick in the pants. Tomorrow night I'll make some very, very hot salsa. You couldn't handle it. And that's just the way I like it! Those look so good. Salsa (drool).